Not since the 1960s has the world witnessed a drug phenomenon like the rapid and widespread emergence of Ecstasy. Described by enthusiasts as the most intense euphoria they know and by detractors as a cause of brain damage and even death, Ecstasy has engendered unprecedented levels of interes -- and misinformation. While Ecstasy is found across America in living rooms and dance clubs, reliable information about the drug is not. Now, Ecstasy: The Complete Guide takes the first unbiased look at the risks and the benefits of Ecstasy and the real drug behind it, MDMA, offering a critical resource for anyone seeking credible information. From the world's leading experts on MDMA, readers will learn the scienec of how it works; the health risks associated with the drug; its promist as a treatment for depression, post-traumatic stress disorder, chronic pain, and other iillnesses; and how to minimize the health risks of illicit use. 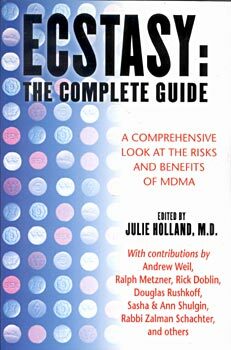 Whether you are a concerned parent, a professional wanting the most recent reports on MDMA research, or a raver, Ecstasy: The Complete Guide provides the answers you need. "MDMA is a unique compound with great potential for positive use. This is the most complete book about it, with much information to help people realize that potential as well as reduce any possible harm." "Ecstasy: The Complete Guide offers a thoroughly engaging, multifaceted look at a very controversial substance. Well done." "This is the best contemporary overview of MDMA, one which simultaneously succeeds for popular and scientific audiences. Encyclopedic in its scope, it is at the same time most readable." Julie Holland, M.D., is an Attending Psychiatrist at Bellevue Hospital and is on the faculty of the NYU School of Medicine. A recognized expert on street drugs, Dr. Holland has discussed Ecstasy in the Lancet, Harper's, and the Washington Post and has provided expert perspective on the drug for numerous television programs, including the MTV series True Life. Other contributors to the book include Ralph Metzner, author of Maps of Consciousness and Green Psychology; Andrew Weil, author of eight books including 8 Weeks to Optimum Health and Spontaneous Healing; Dougas Rushkoff, author of Cyberia and Ecstasy Club; Rabbi Zalman Schachter, author of From Age-ing to Sage-ing; and Rick Doblin, founder of the Multidisciplinary Association for Psychedelic Studies. Royalties from the book will be donated to fund clinical MDMA research.